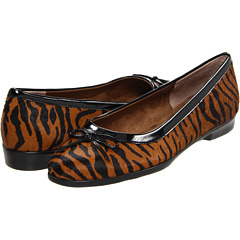 Tiger print flats for every day style and comfort. Bow accent at the vamp. These adorable shoes will make you radiate. Since 1987, Aerosoles has developed high quality, comfortable and fashion-right shoes at affordable prices. Aerosoles shoes offer a vast assortment to suit every occasion. From office wear to weekend gear and everything in between. You get the greatest footwear styles designed with a modern approach to improve the way you live, work, and play. Aerosoles mission is simple and clear: To be the number one product-driven footwear company in the world. The perfect blend of fashion and comfort makes the Aerosoles shoe – whether casual, dress, boot, sandal, or tailored – unique.